The day we brought Benjamin home from the hospital was the day all the adults let out a sigh of relief... it was a week after his birth, and a few days after the heart surgery that saved his little life. However there was one person in the household less than happy about the new arrival... big brother Nathan. 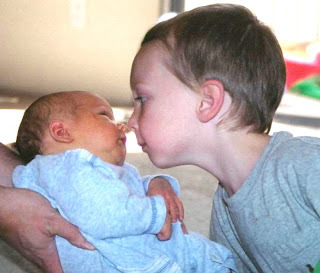 It took four months before they got this close again, and it's been five years since this photo was taken. I can't say for certain if Nathan is any happier today about having a little brother than he was back then, but at least Ben is a lot more fun to play with these days! I remember those little boys! Aaah, good times... Naomi and Nathan screaming (yes, Naomi had the knack to egg him on), trying to keep "Baby Benjamin" safe from his brother... Those were the days, eh?